Tired of your sunglasses sliding off the dashboard and your cell phone slipping between the seats in your car? Siconi has a sticky solution for nearly every situation. Made of high-grade silicone that suctions to almost any smooth surface, both sides of The Sticky Pad and animos are self-clinging which means no sticky residue, as well as the ability to stick to surfaces where a pushpin just won’t do the trick. With proper care and cleaning (simply wash with soap and water), Siconi products can be re-applied and reused over and over again. The rectangular shaped Sticky Pad comes in multiple sizes and is heat resistant up to 140 degrees Fahrenheit making it ideal for securing your cell phone, sunglasses, and other loose items in the car. It also creates a strong suction on vertical surfaces like the fridge or a wall. In fact, our tester used it to hold that ever-elusive T.V. remote in place. You know that “to do list” of yours—the one that’s buried under a pile of “to dos”? Put it front and center on a Sticky Pad. Or have a bit of fun and stick your list to animos (also great for hanging photos). Who knew this eco-friendly, non-toxic material had so many uses? Now, the question is where will you stick yours. The Siconi brand is synonymous with innovation, quality and value. Our goal is to continue to be creative and evolutionary in our product design and manufacturing, to deliver better living to every modern home. Siconi products are special anti-slide silicone. It cares for your safety and comfort by holding small objects such as cell phones, glasses, MP3 players, pens, flyers and many more from moving or flying all over the place. This looks exactly like what I've been wanting. Question is -- can you cut it to size/shape? Yes, you can cut it to size or shape, however you'd like. Send us a pic if you make something cool - others would probably like to see how it can be used that way. Since the Sticky Pads are made of a soft silicone it is very easy to cut them to whatever shape or size you want. Wondering if you put 3 or 4 of these up would it work to hang a light canvas picture? We wouldn't recommend this. The canvas itself isn't porous so wouldn't be reliable for that. @Amy I believe you meant the canvas IS porous. The silicon sticky pads only work with smooth non-porous items. From all the testing with different materials I have done, the smoother the surface of an item you are using on the Siconi products the better they work. Fabrics will last for a short time, but the more fibrous the material the less Siconi can hold on to it for an extended period. Thanks for that correction, yes I did mean IS porous. As Robert says, the more fibrous, or porous the less Siconi is able to hold securely. Do these work on those non-magnetic (titanium?) refrigerators? 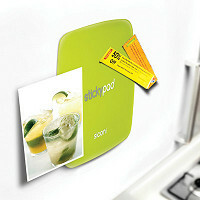 Siconi works great on all refrigerators. Siconi is a special type of silicone that sticks to nearly anything without leaving any residue behind when you decide to move it. Will they stick on stainless steel refrigerators? Siconi works great on all refrigerators. The smooth surface of the steel is ideal for Siconi. Siconi is a special type of silicone that sticks to nearly anything without leaving any residue behind when you decide to move it. Can you tell me the dimensions on these? I can sort of figure it out with reference to the stuff stuck on the green ones, but how big are the animals? You can always find this info in the details section right under the "add to cart" button. You show a set of keys sticking to the pad. You also mention that smooth surfaces work best. Questions: how smooth does the surface have to be, and how much weight can the pad support hanging vertically. The surface should be fairly smooth in order for the suction to be the strongest. Great question about the amount of weight it holds - we tested it with a hockey puck which weighs about 5.5 ounces or a little less than a pound. If you do find that it can hold more than that, do let us know. A pound is 16 ounces, 5.5 is a lot less than a pound. How much can it hold, 5.5 ounces or up to 16 ounces? The smoother the surface the better the Siconi works. Something like a metal filing cabinet or a nonporous wall, or glass windows will work great. One thing to all ways keep in mind is to make sure everything is clean. The wall the Sticky Pad is going on, the Sticky pad itself and whatever you are putting on the Sticky Pad. Dust and dirt will weaken the strength of products. The great thing about Siconi is it is easy to wash and works like new when it is clean! The Siconi products are surprisingly strong. As mentioned above, they work best with a clean smooth surface, but also the more surface area of the item that is stuck to the pad the stronger grip it will have. One of the smaller Sticky Animos, the birdie, held my phone, about 6.4oz, for an extended period of time easily. There is no doubt in my mind that a Sticky Pad can hold an item over a pound, as long as it is shaped right and can grip enough of the item. Sorry for any confusion here. We tested it with a hockey puck and they weigh about 5.5 ounces. We can give our seal of approval up to 5.5 ounces, much less than a pound. Ok so now I am also confused....you talk about a flat "clean smooth surface" but then on the video shows it in the car on the dashboard which is not a flat or smooth surface. So how well does it really hold up there? I find that this is one of the most difficult places to get things to hold up. So how well does it really work? Yes, the Siconi works really well ("surprisingly well" as Robert says above). It does need as flat of a surface as possible and the dashboard is flat. Even though there is a slight curve on that dashboard in the video, the pad is taking advantage of all of the surface area on the dashboard, which makes it stick very strongly and anything that sticks to it will stay in place. Hope that helps, but please let me know if you have more questions. This board is closed, but our customer service team will be more than happy to help. You can look at our site and scroll to the bottom. You can click on where it says "need help". Tired of your sunglasses sliding off the dashboard and your cell phone slipping between the seats in your car? Siconi has a sticky solution for nearly every situation. Made of high-grade silicone that suctions to almost any smooth surface, both sides of The Sticky Pad and animos are self-clinging which means no sticky residue, as well as the ability to stick to surfaces where a pushpin just won’t do the trick. With proper care and cleaning (simply wash with soap and water), Siconi products can be re-applied and reused over and over again. The rectangular shaped Sticky Pad comes in multiple sizes and is heat resistant up to 140 degrees Fahrenheit making it ideal for securing your cell phone, sunglasses, and other loose items in the car. It also creates a strong suction on vertical surfaces like the fridge or a wall. In fact, our tester used it to hold that ever-elusive T.V. remote in place. You know that “to do list” of yours—the one that’s buried under a pile of “to dos”? Put it front and center on a Sticky Pad. Or have a bit of fun and stick your list to animos (also great for hanging photos).